Mary and Joseph present Jesus at the Temple in Jerusalem. The fishermen (Simon, James and John) leave their nets and follow Jesus. 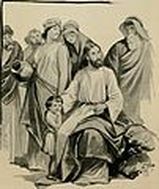 Jesus teaches his disciples to be merciful as God is merciful. Jesus teaches his disciples not to judge others.